The family bathroom is one of the hardest working rooms in our home, but that doesn’t mean it can’t be attractive! 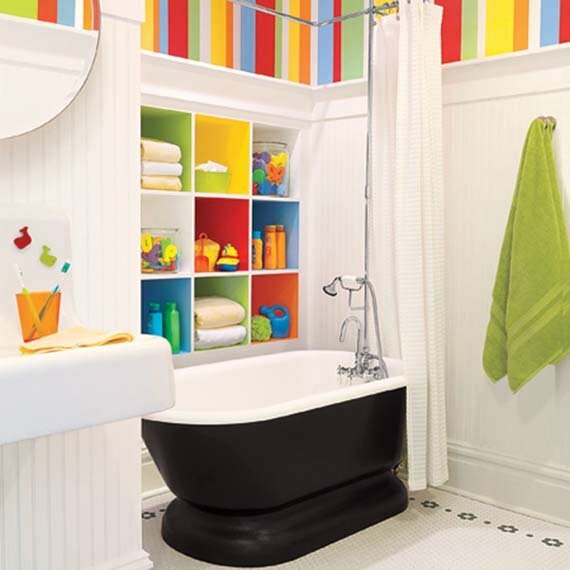 Here are some inexpensive and easy fix ups for any family bath! Paint those walls! Paint is cheap, and a deep, rich or bright color will be appreciated more in the small space. 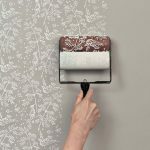 It will help those ever closing in walls to fade away, and a deeper color shows far fewer dirty hand-prints! 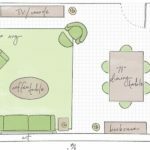 Keep the whole room in the same color family as the walls for a space expanding effect. 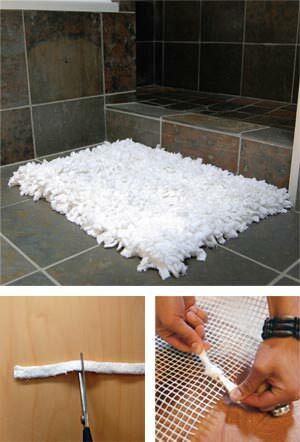 Make a large and easily laundered floor rug for the bath by bordering a bath towel with scrap fabric with your sewing machine. Use a non slip pad under the rug. It can be hung over the shower rod to dry and tossed in the washer whenever needed, without wearing out the latex backing! Or you can try this tutorial from Fine Craft Guild for fluffy towel rug. 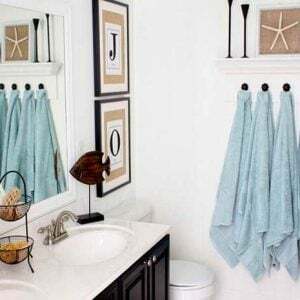 Add a similar border with the same fabric to the bottom edges of your hand towels to add color and to pull the room together. 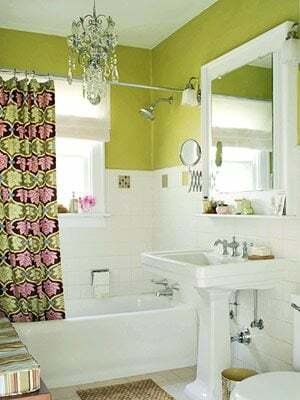 The more together the room looks, the less effect morning chaos will have on your bath! If you have a fabric shower curtain, add it here as well! 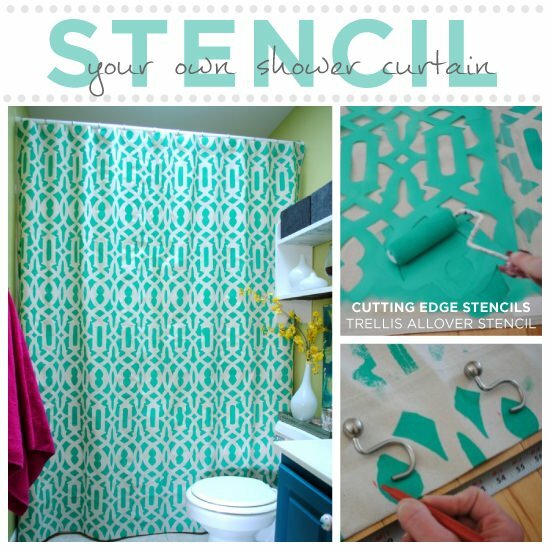 Cutting Edge Stencils has a great project on stenciled shower curtain. 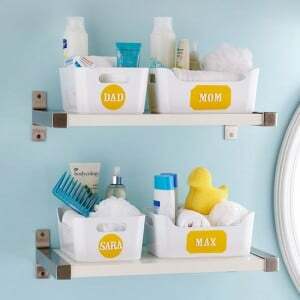 Install a shelving unit over the toilet, but go one step farther in giving each family member a plastic bin or bucket from the dollar shop to organize their personals. Make all the bins match to cut down on the clutter look many baths have. Write their names on in permanent marker or paint pen. Assign everyone a bath towel, and write their names on the hem. Attach self stick hooks to the back of their bedroom door, where they can hang it each day to dry. The towels in the bathroom itself will be hand towels. 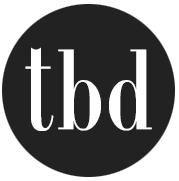 This will eliminate (hopefully!) the 16 dirty towels on the floor of the bath, and save you time and money doing laundry! 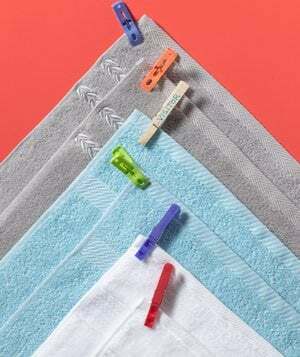 Or this cute idea, from Real Simple…attaching color coded clothespins to each towel, or write their names on wooden ones! Finally, consider investing in a detachable hand held shower head for the bath. 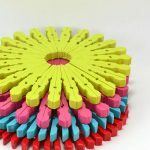 These are ever so convenient when washing the tub, the dog, or a little ones hair, and the massage feature is great on your back! A good quality one can be found for under $30, and is a great investment for the whole family. 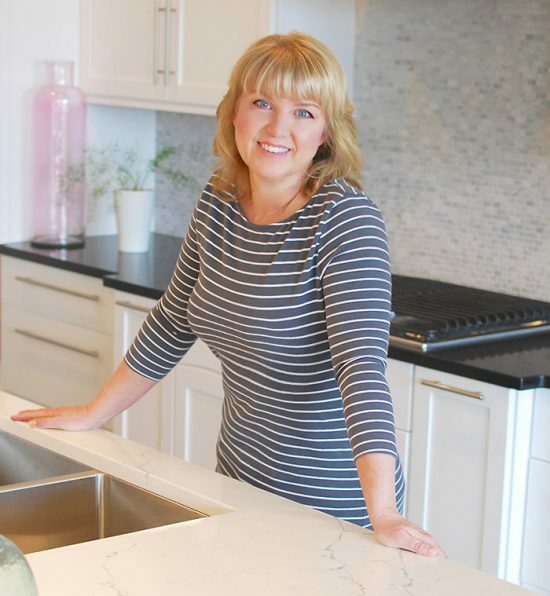 A little time, a few bucks and a little organization can go a long way into turning the hardest working room in the home to a bit more of a space to take care of your loved ones! Great affordable easy tips..Thanks for sharing! Im working on the rug as we speak.